Dear Pakistani students if you really want to study in China from Pakistan, then time is very limited, China offering lots of scholarships for international students, don't waste your time in thinking just go for it and grab your scholarship seat until its too late. The Quality of MBBS and Engineering education in China is Excellent and China Degree is Recognized all over the world, and you will get China student Visa Easily, even if you have past Visa rejection from any other country. China offers great and excellent opportunities in the form of scholarships for international students, especially for Pakistani students. If you have low budget then study in China will be the best, cheap & affordable option for Pakistani students. China Literacy rate is 100% because the China Education system has made 9 years of education compulsory for every student in China, so every student has to complete the primary as well as middle-level school education. Only China is the No.1 Country in the world which holds the great history of Educational background. According to Government agencies, China has 456900 primary schools & the enrolment rate of these schools is 98% which is remarkable and hold the number one position, & the Literacy rate is going up day by day. China is spending a huge part of its GDP to make the educational environment modern and to make their students compete globally & China Universities already gained the International label. STUDY ABROAD IN CHINA from Pakistan is a great option to explore a new culture, we will guide you step by step, how to apply for study in China and how students can get scholarships, China Government has spent so much money in the field of education to gain the international recognition, this article will be very helpful for those students who want to study in China from Pakistan. Questions about Study in China from Pakistan: This Guide is for Pakistani students who want to study in China. Best & top universities to study in China for international students? How much the Average tuition fee for undergraduate or postgraduate courses in China? The tuition fees are 2000$ to 4000$ for Bachelor and Master programs the fees vary from university to university on annual basis. the tuition fees always depend on the course you select in China. if you are going to study Arts subjects then you have to pay fewer fees as compared to MBBS and Engineering programs that Cost you High. Study in China from Pakistan. Can an international student do part time job in China? a Chinese University (or a well-known university abroad) will be able to work in China and get a work permit and employment license. To start their career as English teacher will helpful to earn good amount of many which support their educational and living cost and student can easily interact with local people. 1. To be 18 years or older, in good health and to have no criminal record. 3. Have a relevant degree or education certificate. 6. Have a passport or equivalent travel document. Qualified international students at Chinese universities will be granted work permits and employment licenses. According to the international athlete's and world official bodies the Accommodation, the environment is very peaceful & friendly in China, So the Pakistani students who wish to study in China can get very good accommodation in China at a very cheap price, on campus and off campus accommodation both are available in China. On-campus accommodations are based on Dormitories, which offer single, double and triple bedrooms for international students. these dormitories include bedding, TV, proper kitchen setup, AC and lockers facilities for students. If you want to live outside the campus then you have to get permission from the university, you can find off campus accommodation very easily by searching online expat websites in China, usually, off-campus accommodation cost less money, because students mostly share the room space, the cost also depends on your lifestyle. What kind of scholarships are available in China for International students? So many Scholarships are also offered by China Universities or by organizations for the international students, students can contact Flyup Consultants (03004888642) to get the Scholarships. What are the admission requirements for China universities? If you want to apply for Bachelor degree in China university, then you should have the intermediate certificate, for Masters you should be bachelor degree (Bs honor's) holder, and if you want to apply for Ph.D. you should be Master degree holder. Every university has their own admission criteria, and all the admission requirement are mentioned on their official websites. Study in China from Pakistan. Is IELTS is compulsory for study in China in English Medium? IELTS is not required in China, If you want to study in English medium in China, then you can provide them English Proficiency certificate, you can get this certificate from your College or University where you studied your last degree. Study in China from Pakistan. and if you want to study your interested degree program in Chinese Language, then you have the learn the Chinese language First, and you have to pass the HSK (which is Chinese Language Test) Level 5 Test in Pakistan, then you will be eligible for Chinese medium program. Study in China from Pakistan. If you are going to China for Higher studies on Scholarship, then your tuition fee & Hostel fee will be covered by the scholarship, you can Consult Flyup Consultants leading Education Consultants in Pakistan for China. you only need the money for food, Approximately you need 10000 Pkr per month for Food & other expenses in China. 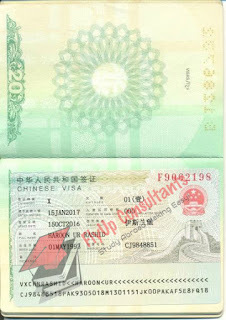 How can I get the China Student Visa? International students who want to study in China for Longer then 6 months are required to apply for x1 Visa, and who intend to study in China for no longer then 6 months like for a short course are required to apply for x2 Visa. Students are required to submit the following documents to get the Chinese Visa, student needs to prepare 2 Files. Bank statement 5 Lacs or Above(6-month statement required ). Admission Notice & Jw202 Photocopy. Admission Notice & Jw202 Orignal. Medical Report. ( Horizontal ). After submitting these documents the embassy will conduct a short interview and if will you pass the interview, the embassy will issue you a receipt, after getting the receipt you will get your passport after three working days with Chinese Student Visa on It. After that Buy A Ticket and Inform Flyup Consultant so that we will arrange the Airport Pickup for the student. The student will have to go through the Registration process on arrival in the university, the university will guide the student.